As we approach the year's end, it’s a great time to reflect. Take this time to review your financial goals and make plans to do better next year. WASHINGTON — As we approach the year’s end, it’s a great time to reflect. Did you make good progress toward accomplishing your financial goals, or not really? If not, what hurdles got in your way and what can you do better next year? At Her Wealth®, we are big advocates of practicing “intentional wealth.” At its core, practicing intentional wealth means having a defined purpose with clear directions for your wealth. Quite simply, your long-term financial success will not happen by accident or on its own. It requires intentional planning, taking definitive action and making appropriate adjustments along the way. Before you can practice intentional wealth, you need to understand what’s getting in your way. Let’s take a look at some of the common hurdles that may have derailed you from achieving your financial goals this year and then get you back on track to practicing intentional wealth for next year and every year thereafter! Keep in mind that life will always “get in the way” if you let it. Too busy with your daily life (i.e. work, kids, caring for parents, etc.)? Tell that to your future self when you are 66 or 70 years old and don’t have enough income to support the retirement you dreamed about! You just missed 30 years of thoughtful planning and mighty compounding. As we have said before: start early, save regularly and take advantage of the power of compounding! Feeling overwhelmed with too many competing goals? That’s a normal reaction, so take a deep breath. Recognize that a comprehensive financial plan will have many steps, so break your big picture plan into small, manageable and achievable action steps. This is a good time to use the expertise of a financial adviser who will strategically guide and advise you and, most importantly, keep you on track toward financial success. “I have no extra cash, so why even bother?” No one likes to budget, but being intentional about your spending is a cornerstone to your long-term financial goals. Everyone should know how they are spending their money, regardless of their income level. Track your actual spending, then analyze your expenses and see where you can make changes, such as eliminating impulse purchases and reducing your personal spending. Reorient your mindset and cash flow so that discretionary spending is replaced with planned savings. I will get to “it” tomorrow. “It” can be many things that impact your financial health besides lack of savings or an out-of-whack budget, such as not updating your estate plan or not addressing your life insurance needs. Tomorrow will be too late for the widow and young family whose life has been turned upside down without adequate life insurance death benefit protection or a thoughtful estate plan in place. Life is full of uncertainty, so having a financial plan in place allows you and your family to navigate through these unexpected changes. The best way to set yourself up for success in the new year is to have a clear picture of what a comprehensive financial plan looks like and what areas you should address first. Take our financial fitness checkup to learn what areas you have handled and what may be missing in your financial plan. Our financially fit for life guide provides 12 clear steps for building a strong financial foundation. 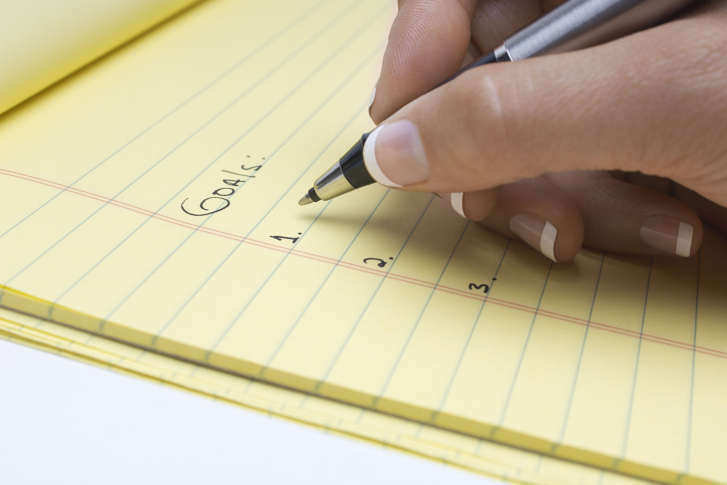 Write down your top three short- and long-term goals. While many people have a general sense of their financial goals, many simply do not take the time to write them down, prioritize them and discuss them with their spouse or partner. Having multiple, competing “top” priority goals can be overwhelming and realistically not attainable. The more specific the goal, the more likely you will commit to it and be accountable for achieving it. For example, saying that you want to have a $1 million nest egg at retirement is not nearly as impactful as committing to funding $18,000 a year for the next 25 years in your 401(k) plan with a targeted annualized return of 6 percent. If you commit to this, the future value of your employee 401(k) contributions (without employer matching) will be approximately $1,047,000. Set specific dollar targets that you can automatically fund each month (or as frequently as you can). Don’t be afraid to dream big. For those goals that are truly long-term, such as funding for your child’s college and your retirement, it’s important to calculate how much you will need to methodically save each and every month and for how long. This can be done with the help of your financial adviser or by using online calculator tools. Set mini-milestones along the way for these funding goals and celebrate when you achieve them. This can motivate you to keep your eye on the prize. Too often we see retirees spending down their savings at an unsustainable rate because they are not paying attention to how much they are actually spending or do not know how much they should be spending, especially given longer life spans and increasing health costs. Based on several studies, one of the biggest fears for many women is outliving their money. For those readers approaching retirement within the next five to 10 years, take a look at Her Wealth’s “Fearless financial plan for retirement” to better prepare you. Focus and goals don’t mean much without targeted action — that’s the point of practicing intentional wealth. Once you have your list of goals in priority order with quantified money targets, consider ways in which your daily actions can contribute to the success of these goals. Success is built over time and good daily habits have a domino effect. The success of certain financial goals is based on your consistent (and automated) commitment to long-term savings and investing, but other “non-savings” goals are just as important. Having an updated estate plan with medical power of attorney regardless of the size of your estate. Being knowledgeable about your employee benefits and maximizing them appropriately. Reviewing your insurance needs and filling in the gaps with additional coverage as needed. Understanding the inputs of your tax return and making sure you are taking full advantage of all tax deductions. Actively reviewing your investment statements and not throwing them in a desk drawer. I think you get the picture: A comprehensive financial plan includes many components and is an engaging process. Your action plan should include blocked off time on your calendar each month so you can focus and implement your priority goals. Have regular meetings with your financial adviser to review your progress and results; let your goals direct your decisions and live your daily life in alignment with your goals. In the spirit of holiday giving, may your gift be to empower yourself to take control of your financial wellness in 2018 and beyond. Nina Mitchell is partner and senior wealth adviser at Bridgewater Wealth and co-founder of Her Wealth®.